One of the highest compliments I can give you is by saying I want to shove you down the stairs. It means you have such an abundance of gifts, I want to steal some a la Eve in the movie that’s all about her. Thriller writer Gregg Hurwitz is someone I’d like to shove down the stairs twice. But I can’t. Because he’s cool. And he’d probably “punish” me if I tried (more on that later). 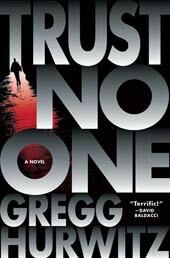 Among other accomplishments, Gregg is the author of nine novels, the latest titled Trust No One (out June 23). It opens big, gets bigger, and hurtles towards an explosive finish without shedding character development and logic along the way. Gregg writes with equal parts intelligence, heart and muscle—what else can you ask for? The plot: Nick Horrigan has been waking at 2:18 a.m. every day for almost two decades due to a traumatic incident which destroyed his life and sent him on the lam when he was seventeen. He’d just started sleeping normally again when an LAPD SWAT team storms his apartment one night and drags him out of bed. A terrorist has barricaded himself inside a nuclear power plant and given the edict he will talk to only Nick. But Nick doesn’t know the man and has no idea what’s going on. Turns out the so-called bomber has a key to unlock the mysteries in Nick’s past which involved his stepfather Frank. “Trust no one” is the credo Frank lived by (etched as a tattoo on his arm in Japanese characters) and one Nick must adopt to survive. For more info on the book and about Gregg, click here. In the meantime, read on as he answers my nerdy questions. PCN: Since Frank broke the ice with the teenaged Nick by asking, “What do you want me to not do?”, I’ll start with, What do you want me to not ask? Gregg Hurwitz: Don’t ask me about sock puppets. Or Ayn Rand. PCN: Done. You’re Harvard and Oxford-educated, have guest lectured at Harvard and UCLA, swum with sharks, hung with SEALs, zip-lined across gulleys in Costa Rican cloud forests, a pole-vaulting champion, Shakespearean scholar, novelist, comic-book writer, inventor of fire, screenwriter, husband and father of two. Could you please tell me something you can’t do so I can feel less inadequate? GH: I can’t tie my shoelaces except by making bunny ears. My nine-year-old, to her great delight, discovered this some months ago and has been lording it over me. I also can’t find my way out of the proverbial paper bag without help from a GPS system or my wife. PCN: I feel much better, thank you. The U.S. title of your new novel is Trust No One. So if I say your book is terrific, would you think I’m lying? How would I convince you I’m not? GH: Aw, shucks. Okay, I believe you. And thank you. PCN: OK, good. So you’ve said you were interested in joining the FBI during your senior year in college. If you had become an agent, would you have been more like Scully or Mulder, whose motto was also…well, you know. GH: Boy, that’s a tough one. Back then, I was definitely more Scully—I was (even more) argumentative and fact-based. I think I’ve mellowed since into a more Mulder-esque “there are more things in heaven and earth, Horatio, than are dreamt of in your philosophy” mindset. PCN: Horatio couldn’t have possibly dreamt about the kind of nuclear threat at the beginning of TNO. That was alarming. Did your research into that make you wake up in a panic at 2:18 a.m. every day? GH: Not exactly. But I will say this—there’s a lot of scary stuff out there. And part of my job as a thriller writer is to find a type of threat—a NEW type of threat—and present it in a way that puts ice in readers’ veins. This isn’t always the obvious threat, and it shouldn’t be one that people have seen or read before. Often, the best stuff comes in at a slight angle. And so the threat that Nick confronts in that power plant in the opening sequence isn’t what readers will expect it to be. That said, the book shifts gears very quickly from there; it becomes very much about Nick’s struggle to reclaim his identity. PCN: One of the themes in the book is that it’s not what a person says or promises, it’s what he does that defines him. What do you do every day that makes you who you are? GH: Well, most obviously, I write every day. I think a lot of people want to be writers, but very few actually want to write, so that’s something that’s very defining—the activity itself. Mostly, I try to be a man of my word, to uphold promises, to be honest even when it’s not convenient. I do okay at it, I hope. Those are the values I want to instill in my kids, and those are the values that Nick learns from Frank, his stepfather, in Trust No One. Frank doesn’t say much in the book, you’ll notice, but he sets a very strong example by what he does. PCN: Frank’s a great character. I like how he’s not some cliché stepdad who’s a jerk to his stepson. But if you were in Nick’s shoes and had to go on the run for 17 years, where would you go and what would you do? GH: Well, I do have it a bit easier, since I’m an adult (or simulate one reasonably well). What’s really damaging for Nick is that he’s forced onto the run as a seventeen-year-old and cut off from his family—and his entire life. For me, I’d probably go somewhere near lots of bookstores and bourbon and live in a tent. PCN: You have lots of jobs now but what was your first paid writing gig and what did you do with the check? GH: I was very fortunate early on; I sold my first thriller, The Tower, right out of school. And the check went, boringly enough, straight into the bank so I could keep writing and not have to get a real job. Writing is all I ever wanted to do, so when I got paid, I wanted to bank as many months as I could to keep doing it. PCN: Wait, how did you manage to sell your first novel right out of school? You had time to write a book between term papers? PCN: You don’t just write novels; you’ve written Wolverine, the Punisher and Foolkiller for Marvel Comics [Marvel just announced Gregg will also be taking over Moon Knight]. Which character is most like you? GH: Wow. It seems there is no un-arrogant way to answer which superhero one most resembles—who are you most like, Einstein or Oppenheimer? But I’d have to say, uh, okay, [the Punisher] Frank Castle. Mostly because I wear a skull T-shirt around a lot. PCN: But you do help save lives. Your third novel, Do No Harm, saved a man’s dog. What other useful tips can readers get from your books? GH: They can learn how to boost a car, avoid getting sucked into a mind-control cult, and (in the restaurant scene in Trust No One) figure out how to navigate the coolest and most scary conceptual dining experience out there! PCN: That restaurant scene was freaky! I’d be scared to stick things in my mouth I can’t see. Speaking of dining, I love the perfect anniversary date Nick comes up with at the end—Capra or Howard Hawks, Inn of the Seventh Ray, Shutters, the pier, etc. But that’s expensive. Any ideas for the perfect L.A. date on a budget? GH: L.A.’s a great budget place for a date since there are so many aspiring not-quite-there-yets hanging about. The beach is always a short drive away and always wonderful, whether for a walk or a picnic. The Farmer’s Market at 3rd and Fairfax is terrific—great cheap food from all cultures. Olvera Street—the historic first street in Los Angeles—has the best taquitos in the world. Oh, and a walk around Venice Beach is like warping to another world. Hippies, head shops, soft-serve ice cream, arts and crafts, Muscle Beach. Last time I was down there I popped in to a storefront running a literal freakshow so one of my daughters could see a sheep with two heads. PCN: You can get tattoos down there, too. If you had to get one of your life mantra, what would it say and in what language would it be? GH: I think it would simply be the yin and yang—dark and light, reconciled. Form a line, take a ticket. 🙂 Seriously though, I love it that good things do happen to nice people! And that hard work does pay. This book sounds like a real thriller – onto The List with it. Thanks as always, PCN! I’m really looking forward to this one. The only thing I have a concern about (since I’m getting it in unabridged audiobook form) is the reader Brilliance Audio has assigned to it, Patrick Lawlor. His narration is good on some works, but he was a terrible match-up with the three Elvis Cole books he performed. Great interview, PCN. You got Gregg’s personality well on it. He’s one cool, generous author (met up with him a couple of times at the recent Festival of Books). Way to go! Wow, that’s my kinda guy – and the books are amazing, too. (Sorry, Gregg, couldn’t resist 🙂 Hard to imagine Gregg’s books needing improvement (they don’t) but Patrick Lawlor’s voice is almost gilding the lily. I love his narrations for the T. Jefferson Parker’s he’s done. That Gregg Hurwitz!!!!! Thank you, PCN!!!! What a fantastic interview!!!!!! Tomorrow can’t come soon enough!!!!! I can’t wait to experience TRUST NO ONE!!!!!!!!! The book sounds interesting and Gregg does sound cool. I’ll check it out. I’m so glad you asked fun questions, PCN. If I have to read or hear someone ask “where do you get your ideas?” or “do you outline?” one more time, I’m gonna hurl somebody down the stairs and it won’t be as a compliment. Excellent interview. Can’t wait to read this new book. Gregg’s work just keeps getting better and better! Shelley P, Gregg will be in Brisbane Sept. 9-13. You can say hello in person! le0pard13, I don’t have any experience with audio books (love the actual eyeball-to-paper experience too much) but hope Lawlor does TNO justice. If not, can you get SWMBO to read it to you? Lizabeth Ann, if I paid you $50, could you BE any more excited?! Veronica, I like that line, too. Lenore, glad you like the questions. I try not to ask Qs that have been asked a thousand times or about stuff that can be easily found elsewhere. Tris, you’ll have to wait your turn in line. As mentioned, I’m throwing him down twice and that might take a while.